With the same great features of the attendant Clean, this chair has large rear wheels for users who can propel themselves. 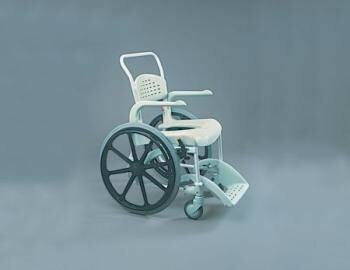 Etac Clean Self-Propelled Shower Commode Chair...With the same great features of the attendant Clean, this chair has large rear wheels for users who can propel themselves. The rear wheels are mounted well back and the brake handles move under the seat edge when applied, leaving plenty of space for safe and easy side transfers. The self-propelled Clean is a well balanced shower chair that is easy to manoeuvre. Maximum User Weight: 20 Stone (130 kg). External depth, excluding footrest 730mm (283/4"). Rear wheels 610mm (24") diameter.